Restrooms: Public, located street side off of parking lot. 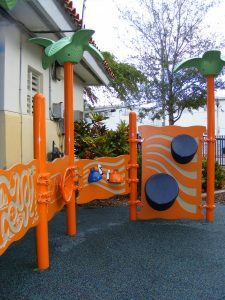 Playground features: Small shaded canopies, poured in place rubber surfacing with ADA accessible play components, panels, slides and more. Available to rent for events & parties through the special events division. Call 305.993.2021 for more information. Under Construction. Site closed temporarily. 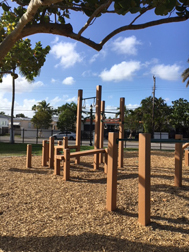 Special features: Shaded play component with poured in place rubber surfacing. “Ship themed” design with various climbing components, music panels, slides, ropes, balancing and body equipment adjacent to an outdoor vita course for ages 12 and older. 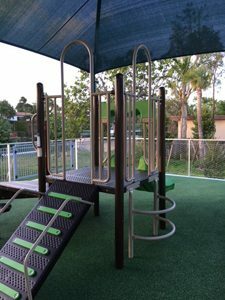 Special features: Shaded play components with mulch, site features various climbing components, play panels, free standing play areas and more. 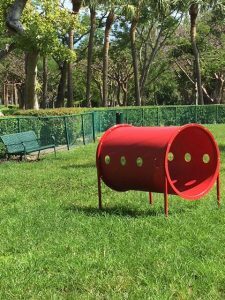 The park features two separate dog run areas, ADA drinking fountain with attached pet bowl, perimeter walking path, waste receptacle and doggie bag dispensers. Call 305.673.7000 x2613 for more information. 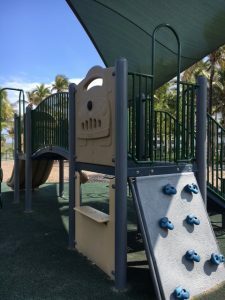 Special features: Play component with mulch and poured in place rubber surfacing, adjacent to a shaded picnic benched gazebo area, basketball court and open field by permit usage. Free standing musical play components, spring rocker and Caribbean themed play component. Available to rent for events & parties. Call 305.993.2021 for reservations. 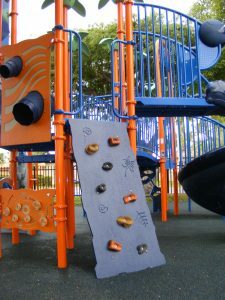 Special features: Shaded play components with poured in place rubber tiles, rock wall, rock climber, 3-spring seats. 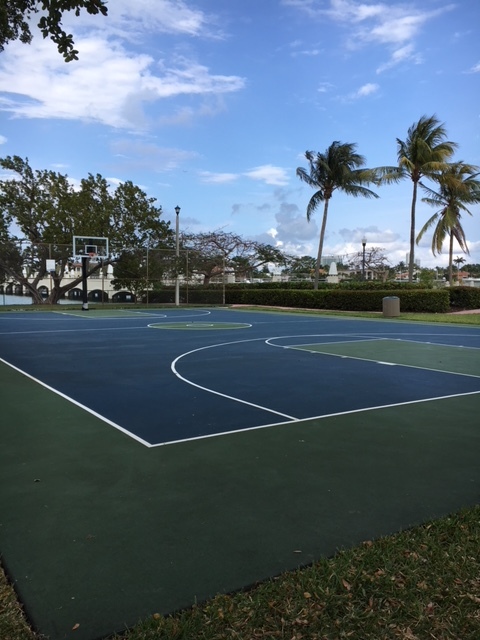 Included on site are public tennis courts, basketball court, gazebo area and open field by permit usage; is adjacent to Normandy Shores Golf Course. Available to rent for events & parties. Call 305.993.2021 for more information. Special features: Shaded play components with mulch and poured in place rubber surfacing “Back to Nature” theme, fenced area with natural shade, shaded structure, sidewalk throughout, “Scape Zone”, tree house and education tree area, themed riders – dragonfly seesaw and mushroom spinner and open field by permit usage. 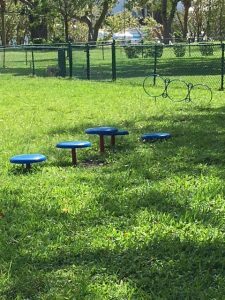 for ages 2-5 and is adjacent to Flamingo Pool, track, athletic fields and tennis complex. Accessible with an Accessible swing. Available to rent for events & parties. Call 305.673.7000 x2613 for more information. Call 305.993.2021 for more information. 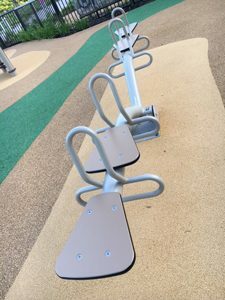 Special features: Shaded play component with mulch and poured in place rubber surfacing, spring riders and seesaw. Available to rent for events & parties. Call 305.861.3616 for more information. Restrooms: Public, several sites located within the park. 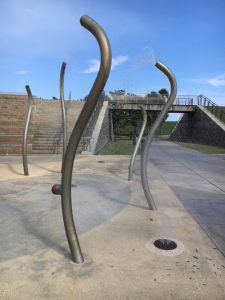 Water Fountains: Yes, located at restrooms and beach wash stations. Enclosed: No, beach access, no perimeter fencing. Age Designs: Equipment is recommended for teens and older. 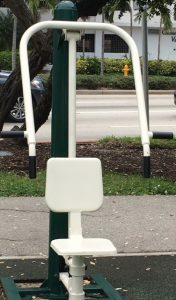 6 Street & Ocean Drive – Ten Healthbeat stations over poured in place rubber surfacing, Accessible. 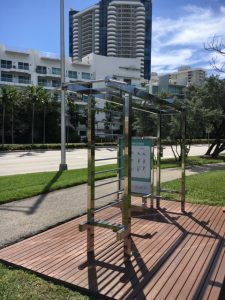 9 Street & Ocean Drive – Beach wellness equipment by My Equilibria, offers over twelve features to build strength, power, agility and stamina. Accessible. Call 305.673.7000 x 6597 for more information. 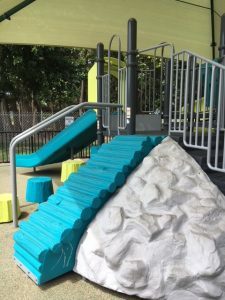 Special features: Poured in place rubber surfacing with a variety of slides, climbing components, play panels and more. Call 305.673.7779 for more information. Water Fountains: Yes, located by the restrooms. 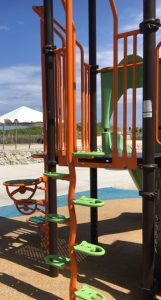 Special features: Shaded play component with poured in place rubber surfacing with slides, climbing and upper body components and play panels. 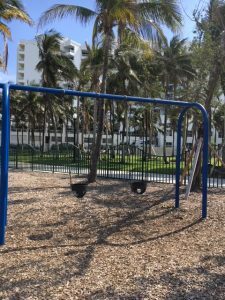 Playground is in a public multipurpose park area and is adjacent to the beach. Available to rent for events and parties. 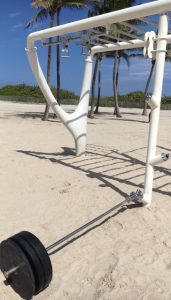 Special features: Shaded play components with poured in place rubber and mulch surfacring, spring riders, arch climber, and upper body equipment. 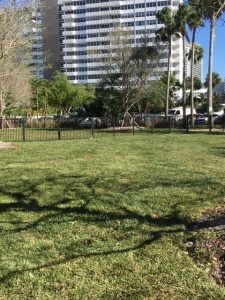 Overlooks the Intracoastal Waterway and is adjacent to a boat launch. The once perfectly circular Monument Island is located on Biscayne Bay between the MacArthur and Venetian Causeways. 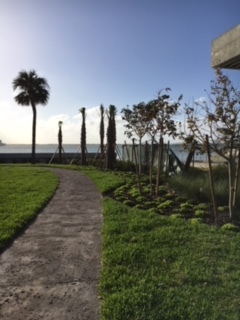 The Flagler Memorial sits in the center of the island and was built in 1921, by Miami Beach founding father Carl Fisher. The 97 foot obelisk, the apex of this island, stands for vitality, strength and fortitude. The obelisk is surrounded by four 18 foot statues, two men and two women, representing education, industry, prosperity, and Flagler’s pioneering spirit. Call 305.673.7730 for more information. 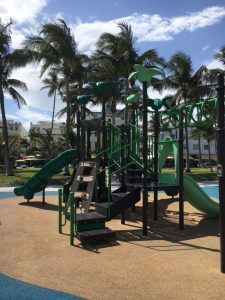 Special features: Shaded play components with poured in place rubber surfacing. 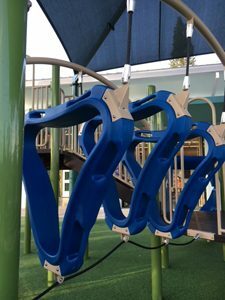 Variety of slides, pole climbers, play panels, ramps, twirlers, open field by permit usage, afterschool program and more. Available to rent for events & parties. Call 305.673.7205 for more information. 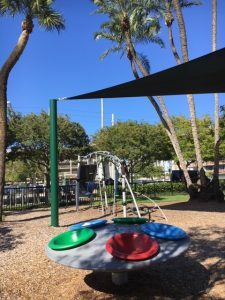 Special features: Shaded play component with rubber tile surface. 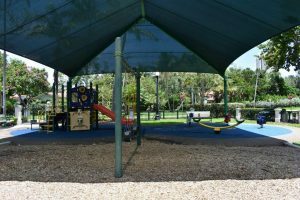 Adjacent to six picnic tables with a covered gazebo, outdoor basketball courts, lighted open field by permit usage, a water play component in the outdoor pool area (fee may apply for pool area). Available to rent for events or parties. Call 305.993.2021 for more information. 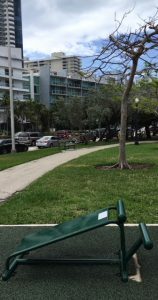 Special features: Is located along Biscayne Bay, has four public tennis courts, eleven piece shaded fitness circuit with poured in place rubber surfacing for ages 12 and older. Beautiful landscaped leisure walking area. Parking: Spaces available on site. 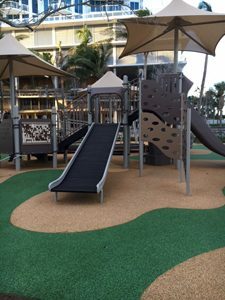 Special features: Shaded play component with poured in place rubber surfacing, adjacent to pavilions and a Para course. 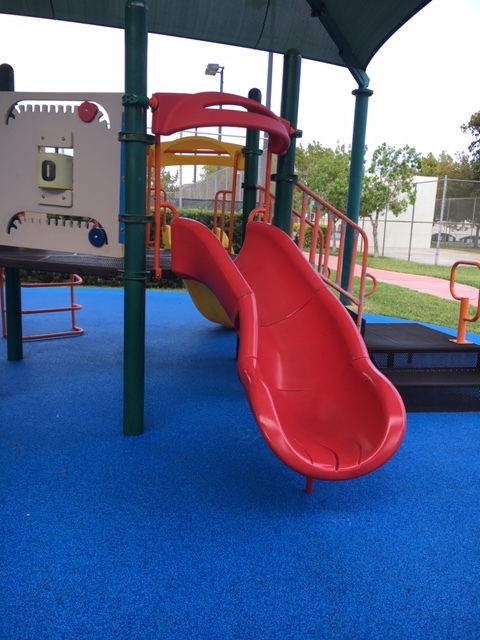 Special features: Shaded play component with poured in place rubber surfacing. 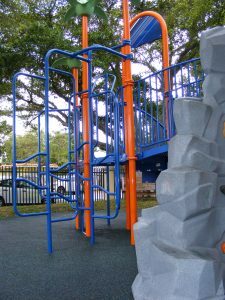 Two double slides, one single slide, small rock wall, bongos, afterschool program and is adjacent to ball fields and outdoor tennis facility. Water Fountains: Yes, located by tennis courts. 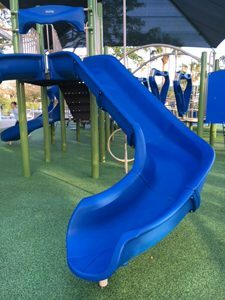 Special features: Shaded play components with poured in place rubber surfacing with a variety of slides, climbing components, play panels and more. 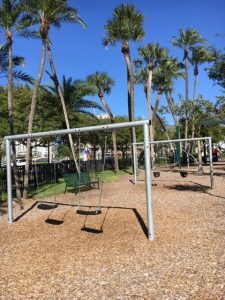 Playground is adjacent to three public tennis courts, a basketball court, open field space, a paddle court and a gazebo sitting area. Available to rent for events and parties. Call 305.673.7779 for more information. 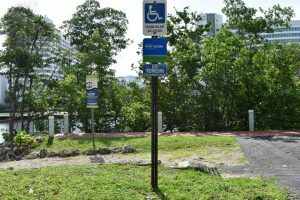 Special information: The kayak launch area is provided for users to launch their own kayaks. Kayaks must be brought into the launch area by foot or mobile cart. No parking or drive up launching on site. Usage of the launch area is free. Rental equipment is not provided. 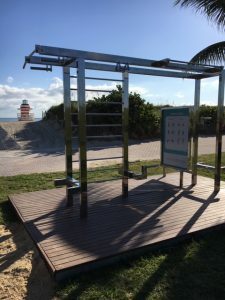 Special features: Shaded play component with poured in place rubber surfacing, slide, climbing net, climbing components with five outdoor fitness zone workout stations for ages 12 and older. Special information: The kayak launch area is provided for users to launch their own kayaks into Indian Creek. Kayaks must be bought into the launch area by foot or mobile cart. No parking or drive up launching on site. Usage of the launch area is free. Rental equipment is not provided. 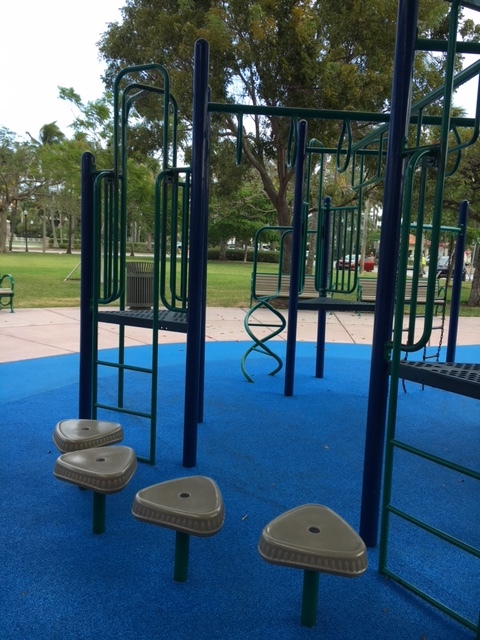 The dog park features two double gated dog runs for small or large dogs, which allow owners to unleash their pets in a holding area before releasing them into the play areas. 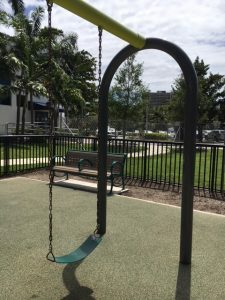 Special features: Shaded play component with mulch and poured in place rubber surfacing, spring rider and twirl around and is adjacent to public tennis courts, basketball courts with open field and ball field by permit usage. Parking: Spaces available at school parking lot and metered public parking spots by diamond. 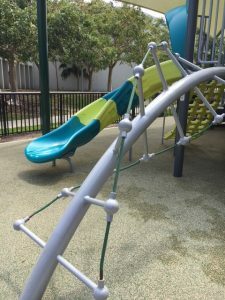 Special Features: Shaded play component with poured in place safety surface. Various climbing components, slide and balancing equipment. Call 305.673.7767 for more information. Enclosed: No, no perimeter fencing and is adjacent to beach access and waterways. 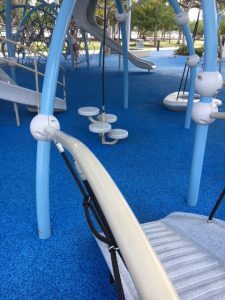 Special features: Poured in place rubber surfacing with a variety of slides, climbing and upper body components, play panels and splash spray zone area. 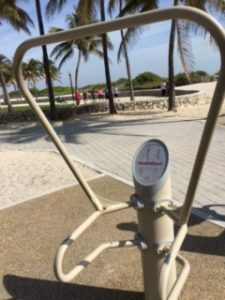 Along the beachside, located in the park, is an ADA accessible workout station. Not available for rent. Call 305.673.7779 for more information. 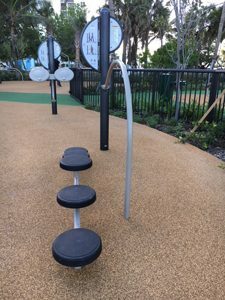 Special features: Shaded play component with mulch and poured in place rubber surfacing, spring riders, seesaw, spider climber and is adjacent to a basketball court; open field by permit usage and outdoor fitness zones for ages 12 and older. 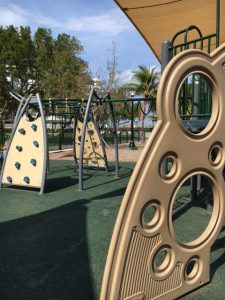 Special features: Shaded play component with poured in place rubber surfacing , adjacent to a basketball court, open field by permit usage and two sand volleyball courts.